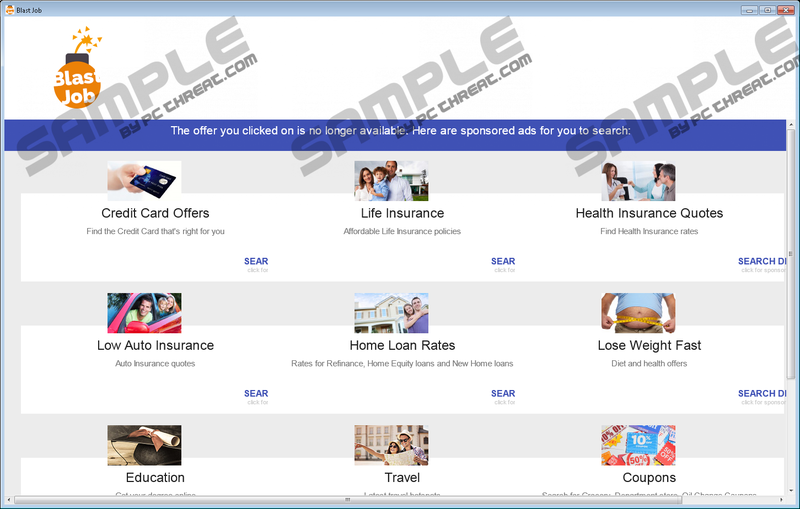 Some users might have been deceived by an adware application called BlastJob. Apparently, the software’s web page lets users believe that the program can help them get a job. However, you should be informed that the application was created to display advertising content through major Internet browsers. At the moment, it is compatible with Google Chrome, Internet Explorer, and Mozilla Firefox. The provided advertisements could be from unreliable web pages that might promote other suspicious applications or even malware. Undoubtedly, we would advise you to remove this questionable program as soon as possible. Further in the article, we will tell you all you have to know about the adware and the risks that come with it. Although if you already decided to delete the program, you should slide to the bottom where you will find removal instructions. Firstly, the adware should create a shortcut on your Desktop, and if you click it, the application will launch its main window. Also, it could open a new browser window or a tab. At this point, the application should load sites with commercial offers, coupons, and other ads. For instance, you could be redirected to redtag-specials.com. The other portion of advertisements will appear as pop-ups while you search the Internet. The question is how such content could help you find a job? Actually, it is you who will be helping the program’s creators because they might be receiving advertising revenue that is generated from your clicks, purchases, registration on the third-party site, and so on. You should keep it in mind that these displayed ads or loaded sites are from a third party, which means that their source is unknown. Therefore, you should be extra cautious with such content as it may be harmful to your computer. There is a chance that some of the third-party sites could have malicious software, e.g. Trojans, viruses, worms, and so on. Another possibility would be that you could be redirected to official sites of browser hijackers, potentially unwanted programs, different adware, etc. If you downloaded the application from its official site, you should know that its installer might have been bundled with other doubtful software. Many users rush through the installation process and do not notice that there are other programs suggested. Consequently, they allow these programs to enter their system without realizing it. If you do not read the information on the setup wizard too, you should check your computer if any unfamiliar applications were installed around the same time when BlastJob appeared. We doubt that the adware could be of any use to you. On the contrary, we think that you should delete the application as it can be rather annoying and potentially harmful to your system. Luckily, this program can be removed via Control Panel, and that should not be difficult for you. Although we can offer another solution, if you do not mind installing a security tool. The antimalware tool would locate the adware, and you could erase it with a click of your mouse. Also, if you keep it updated, the security tool will guard your computer against threats in the future too. Should you have some questions related to the adware, you can always reach us via social media or leave us a message here. Type Control Panel and click OK. Locate the application, select it and press Uninstall. Select BlastJob and click Uninstall. Click on Start and open Control Panel. Select Add or Remove Programs. Mark the application and select Uninstall. Quick & tested solution for BlastJob removal.